some friends hosted an asian-themed dinner party last week with kung pao chicken as the main dish. i was in charge of bringing an appetizer, + thought i’d stay on the asian track to keep the flavors cohesive. i had bookmarked these vegetarian pot stickers a while ago + knew this was the perfect time to try ’em! with the party a couple of hours away, i ran to the store to pick up the ingredients only to find, hmm, no dumpling skins. i didn’t have enough time to hit up a second store, so i just grabbed wonton wrappers + decided to run with it. luckily, they turned out wonderfully even with the slight adaptation. the savory vegetables + seasonings work perfectly with the delicate dumpling skins or wonton wrappers. to add a bit of heat, try the spicy soy dipping sauce listed below the recipe. i made that to accompany them for the dinner party, although when i ate more the next day (+ photographed ’em) i just served them with my beloved sriracha. they were so tasty that i then made another dozen + froze ’em, so i’ll get my fix whenever i’m craving a healthy, tasty, little asian snacker. in a wok or large saute pan, add a little oil + saute onions + ginger. add the mushrooms + stir. add the cabbage, carrots + chives. season. when mixture is soft, place in colander to drain. add the sesame oil + cilantro when mixture is cooled. check for seasoning. 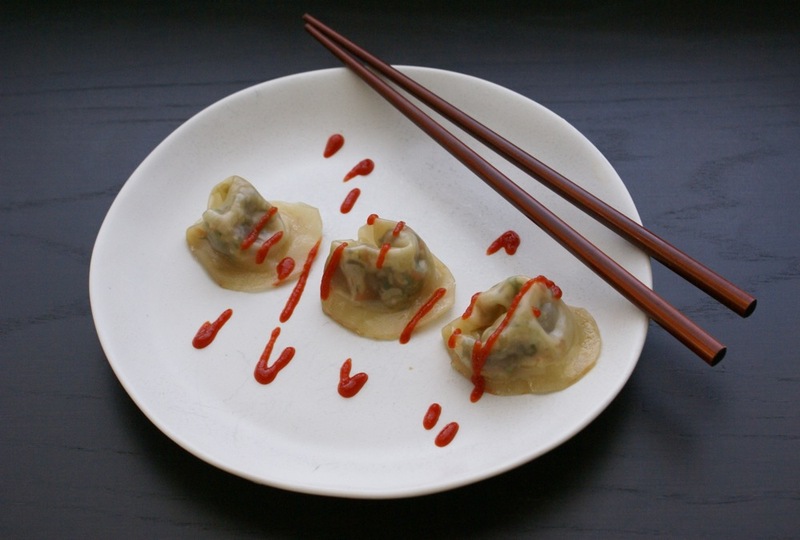 using the gyoza skins (or wonton wrappers), make half moon dumplings keeping the bottom flat. in a hot non-stick pan, coat with oil + place in dumplings. when bottoms gets brown, add 1/4 cup of water + immediately cover. this will steam the dumplings. carefully watch the dumplings + completely evaporate the water so that the bottom gets crispy again + sticks to the pot. combine all in a small bowl + serve immediately. Looks like art! Too delicious to eat… almost! These look awesome and its such a great picture. I gotta try em! Made these last night and the kids loved them. I didn’t fry them but just boiled them in lots of salty water. That’s how they make them in China. Oh my gosh, they look so good! & thanks for letting me know how well the freeze! not a problem – i’m a huge fan of freezing for future use, so i always like to know how well things freeze, too. hope y’all love ’em!